The Conjuring is a rated R film and stars Vera Farmiga, Patrick Wilson, Lili Taylor and Ron Livingston, while directed by directed by James Wan. (The Conjuring films, Fast and Furious 7). 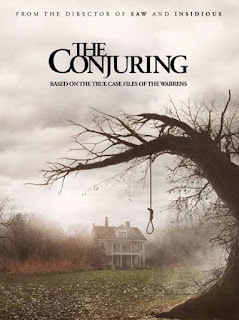 The Conjuring is based on a true story about events in 1970 involving paranormal investigators Ed and Lorraine Warren, as they work to help the Perron family terrorized by a dark presence in their farmhouse. The movie starts out showing us two beginnings, that of paranormal researchers Ed and Lorraine Warren in their more or less, day-to-day lives preaching the good preach about what they do. Then there's the Perron family, who find themselves moving into their new home. While doing so, a few things set off the movie-goers "spider-sense," so to speak. One being that the dog won't go in the house and they find a sealed off basement. HUGE CLUES to run away right there! The first act is mostly focused on the Perrons, as little things develop here and there in their home... you know, the kind of things that might make sane people consider moving out. But they're strapped for cash and stuck in the house. At some point they find themselves reaching out to the Warrens and the fun just starts to roll from there. Based off of events that happened to the Warrens, this film takes you on quite the ride and if you like being rooted to your chair, this is a good film for doing that. It doesn't break any new molds in the fright film business, but it is an entertainingly fun flick to pass the time. Check it out and see what you think. I don't think you will be disappointed. It nabbed a 7.5/10 on IMDb and 86% on Rotten Tomatoes.